Sectorlink Review 2019: Is Sectorlink a Good Hosting? Sectorlink is the ideal host – powerful analytics, e-commerce features, windows and Linux features in one account, easy migration and much more! Sectorlink is a company that manages its own privately owned data centers and provides continuous support to its customers 365 days a year. It has been in business since 1996 and strives to keep the customer as the focal point of its business. If you are migrating from another host, you’ll find your job made simple with Sectorlink’s automated migration tools. Once you are with them, you can manage your websites on both Linux and Windows from the same account (not possible in the Personal package though). They have a 15-day money back guarantee if you are dissatisfied with their product. Installing third party applications is quite easy with the one-click installer. Users who aren’t technically inclined can easily install applications and scripts like WordPress and Joomla without worrying about uploading files and writing code. There are over one-hundred applications that can be installed with the one-click installer. The e-commerce features offered by Sectorlink are what impressed me the most about them. They offer private SSL in all packages ensuring your online shops are secure. Services like Magento, Open Cart, osCommerce, and AbanteCart are also available in all the hosting packages. No matter which package you buy, you will have access to website statistics and analytics, which are instrumental in making your website a success. You get compatibility with AWStats, Matomo Analytics, and the all-important Google Analytics. 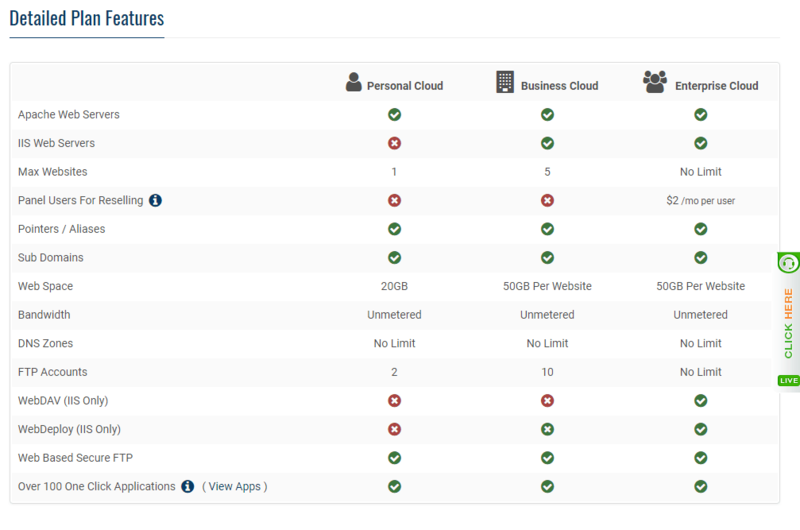 The three packages offered by Sectorlink are named Personal Cloud, Business Cloud, and Enterprise Cloud. All the packages offer a fifteen-day trial period, perfect for testing out their features. The Personal package allows 20GB disk space while the remaining two packages offer 50GB of storage. You can only host a single website on the Personal package, five on the Business package and unlimited websites on the Enterprise package. FTP accounts and email accounts are distributed among the packages in a similar ratio as well. All packages offer unlimited bandwidth, e-commerce functionality, and analytics. Watch out for the scripting languages though as the Personal package only has a limited support for scripting languages. You can pay for 1 month, 12 months, 24 months, or 36 months in advance. The longer time period you pay for, the higher is the discount on your monthly payments. They have different support teams for U.S./Canada customers and for international customers. All support is available 24/7. You can either submit a support ticket or pose your question in the live chat. I went to their live chat section and was promptly greeted by a member of their staff. I asked a question about accepting PayPal payments. It took him a couple of minutes to come back and answer me, but he did answer the question in detail and to my satisfaction. Sectorlink’s offers are quite impressive. There doesn’t seem to be any major downside to their services. They look like the perfect host and the fifteen-day trial period is a great way to check that out. Wondering how Sectorlink stacks up against other Web Hosting companies? Enter any other Web Hosting company and we will give you a side-by-side comparison.